This is nearly how a website might have looked back in 1986. The Waltari was born in the spring of 1986. At a time when there was nothing much going on in Helsinki clubs. At least Kärtsy, Jari and Sale, three Helsinki buddies, thought so and started to toy with the idea of forming a band that would reflect the feelings and thoughts that occupied their minds. The idea became reality when the-drummer-to-be Sale announced that there was a gig to be played at the Tikkurila Comprehensive School where Sale's mum worked. My brother Tote (Now one of the crew) played the bass at the first rehersal but it didn't really work out so Tote suggested I ought to have a go at it. I hadn't played any string instruments before but said I'd do it - but no longer than two months - until a proper bassist could be found. That is why I had the strings like upside down - I'm lefthanded and didn't own the instrument I played. We even had to borrow a bass for our first gig, and by the way, the very first songs we played that particular night were Liisterimies and Nakki. Both of which are featured in this compilation. To everybody's surprise the band remained a trio and I decided to stick with the bass. What set us apart from other bands was the fact that we never stopped gigging. The local evening paper, Ilta-Sanomat, even printed it on the front page: Waltari plays in Helsinki once a week. In 1986, Alibi-Club was the one of the Waltari regulars. We used to do support slot there and usually no one would dig us. Even one of the two bosses of the company that's putting out this CD pointed out to me that Waltari was possibly the worst band in the world. Well, we did play this really strange sounding indie pop that was like combination of prog rock and punk, and people accused us of not having a style of our own. As we couldn't get a deal we recorded some songs on our own in the spring of 1987, and they were finally released as a 12 EP in January 1988. Around that time we'd also got the idea of hosting a club of our own. The plan was to put out the records by ourselves and to play at our own W-Club. It was fun even if we usually ended up in the red. Mind you, we did meet lots of other musicians and club promoters. We ran the regular club night from 1987 to 1989. We were totally awestruck by the budding speed metal scene and heavily influenced by young guys who could play fast but yet with great skill. We met for example our present pals, Sami Yli-Sirniö and Janne Parviainen. The Waltari were entering the new era. Right, the first Waltari EP was released in January 1988 and included six tracks; Living In The Cellars, F.U.C.K. Rap, Sillanpää, Having Fun, Pala Leipää and Tuttu Juttu. 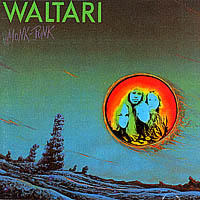 After hearing the EP, the newly founded Helsinki label Sonic Records showed interest in Waltari. They liked the fact that we sounded so original and offered to put out a single by us. The record turned out alright - in fact it bears listening even today. The track chosen for the 7 were Rap Your Body Beat and Shout. It came out in a wonderful round sleeve (as did the debut) with three bald-headed young men pictured on the front cover. We had shaved our heads because we wanted a new look, too. After hearing that jolly speed metal band called Brainwash had suddenly split, we thought - ex tempore - that we'd try to combine their line-up with ours. In the end, Sami was the only one to "forget" his amp in our rehearsal room. He was real good, too. While we had basically played at playing, Sami knew stuff we'd never even dreamed of mastering. The line-up was almost complete... All of a sudden Sale, our long-standing drummer, announced he was leaving so we have to find a replacement. We took in Janne Parviainen, ten years Sale's junior and a young man with attitude. He didn't even have time to rehearse before being shoved into the studio to provide the new Good God/Hevosenkuva single with a mean, funky beat. The single sounded really good, considering the circumstances! It got a very positive response and Waltari were sent to record their first proper album in the spring of 1991. The budget wasn't exactly big, but we were pretty satisfied with the outcome. Waltari had, at least, also acquired a proper manager, Pekka Rahkonen. The early part of 1991 brought along one of the most significant turns in Waltari's career. I called our record company only to hear the answering machine telling me that the guys had popped off to Berlin. Something snapped and I too flew to Berlin the following day. I'd been dreaming about it for a long time; how I'd take a pile of Waltari records and go and sell them in some big city. We all realized that there simply wouldn't be enough gigs in Finland for a fuzzy guitar band singing in English. So, I ran around in Berlin for a week, spreading the word, and was surprised to find that Finnish bands had a good reputation there. After returning home I heard that Angry Fish Music, a small indie company, was keen to release Waltari's debut album in Germany. Monk Punk came out (also in central Europe) in October 1991. The whole crew decided to pack their bags and relocate to Berlin for the winter. For the start, our manager Pekka Rahkonen managed to get a gig for us at the Ecstasy Club during the Berlin Independence Days. To match the theme of the Monk Punk album, we used to go on stage wearing robes and carrying torches. We were happy with the gig and afterwards backstage, one of the people to congratulate us, Gianna Possehl, explained that she was going to work for Roadrunner Records and would try to persuade them to sign us. We were pretty sure that was the last we'd ever heard of her but by the following week Roadrunner had faxed the Stupidos about us. Only goes to prove even wise men can bee fooled! The word about a hot Finnish band started to spread in the Berlin club scene and more gigs followed. When we returned to Finland, the deal with Roadrunner had almost been cliched. We had achieved more in one year than any of us could have imagined. After the deal had been made, even the Finnish gig promoters started to show interest in the band that once had bee deemed a hopeless case. Before the Roadrunner deal was finalised, we agreed with the Stupidos that they would put out another EP which would contain Finnish language material. We still considered ourselves a bilingual group and still do (check out the lingos on this leaflet!). Aika Tuulee EP was released in May 1992 as a kind of 5th anniversary record. After that we've become rock professionals (hopefully in the good sense of the word) - not least because of the fact that after Torcha! album we've toured regularly in Europe. Our new Roadrunner album So Fine will be released early next year but in the meantime, here's a history packed record that contains all the Waltari rarities. 1986: Slayer releases "Reign in Blood", their breakthrough album, and the one that set the stage for many extreme metal bands to come. 1986: Metallica releases their masterpiece, "Master of Puppets". 1986: Megadeth releases their masterpiece, "Peace Sells...But Who's Buying?" Jan 01 - Spain and Portugal enter the European Community, which later became the European Union. Feb 21 - The Dead Kennedys play their last concert at UC Davis in Davis, California. Feb 28 - Swedish prime minister Olof Palme is shot dead on his way home from the cinema. Mar 31 - Judas Priest releases Turbo. Apr 05 - In the terroristic La Belle discotheque bombing the West-Berlin discotheque, a known hangout for U.S. soldiers, was bombed, killing 3 and injuring 230 people. Libya is held responsible. Apr 26 - In Ukraine, one of the reactors at the Chornobyl (Chernobyl) nuclear plant explodes creating the world's worst nuclear disaster. 31 are killed directly by the incident, many more died from cancer in later years, many thousands more were exposed to significant amounts of radioactive material, vast territories in Ukraine and Belarus rendered uninhabitable. May 10 - Tommy Lee of Mötley Crüe marries actress Heather Locklear. May 19 - Peter Gabriel releases So, his first album in over 4 years. Jun 27 - Black Flag play their last concert, in Detroit, Michigan. Jul 23 - In London, Prince Andrew, Duke of York marries Sarah Ferguson at Westminster Abbey. Aug 31 - The Soviet passenger liner Admiral Nakhimov collides with the bulk carrier Pyotr Vasev in the Black Sea and sinks almost immediately, killing 398. Sep 07 - Desmond Tutu becomes the first black to lead the Anglican Church in South Africa. Sep 27 - A tour bus carrying heavy metal band Metallica crashes in Sweden, killing their bassist, Cliff Burton. Oct 11 - Cold War: Ronald Reagan and Soviet leader Mikhail Gorbachev meet in Reykjavík, Iceland, in an effort to continue discussions about scaling back their intermediate missile arsenals in Europe (the talks break down in failure). Nov 12 - Australian singer John Farnham releases the album "Whispering Jack", which becomes the highest selling album in Australia's history.